Decorative clamshell box custom made to fit a rare book. Conservation goes hand in hand with preservation - there is no point in putting in time and effort to conserve rare materials without also taking steps to ensure their preservation going forward. In many cases, preservation means ensuring that the object will be protected with proper storage and environment in the future, so that further deterioration or damage occurs as little as possible. For rare books, one option is to have a protective clamshell box custom made to fit the volume. 1657 volume inside custom clamshell box. This 1657 British law book recently came through our studio for treatment. The conservation procedures were minimal, involving a few repairs to the binding and preliminary pages; however, the client opted to have a custom clamshell box made as well. Surface cleaning the title page. A clamshell box is a protective enclosure that can be custom made to fit any volume. The box opens like a book, with a tray on the bottom to hold the volume, and one on the top to cover it; the cover has a drop spine allowing the box to lay flat when open. When closed and placed on a shelf, it can look like a finely bound book itself, and can be fitted with a label on the spine to identify the volume inside. 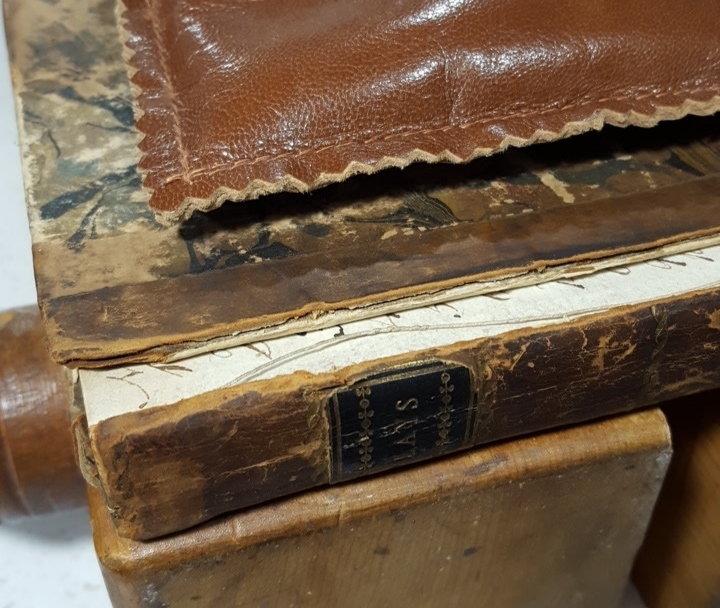 Clamshell boxes serve to protect rare volumes from dust and light exposure, and to mitigate changes in temperature and relative humidity, all factors that can cause deterioration to the paper and leather of antiquarian books. This particular clamshell also functioned as a presentation box, as the book was intended as a gift on a special occasion for the recipient. The label on the front cover commemorates the occasion and the rich red cloth and traditional marbled paper inside provide a luxurious accent to the volume, at the same time as protecting it. The book fits snugly inside the box, with no room to slide or rub. While ready-made drop-spine solander boxes can be purchased from archival supply companies in a selection of standard sizes, the beauty of a custom clamshell box is that it is made to perfectly fit the volume it holds. Antiquarian books often measure in odd dimensions and a custom box will fit the book snugly, preventing it from sliding around inside, which could cause damage to the binding. Construction of a custom clamshell box must be very precise in order to fit the volume snugly. Rare book libraries and special collections often construct custom boxes to protect their most valuable volumes, and the boxes can be made decorative, as in the example above, or more plainly in a conservation style box, as those shown below. A conservation clamshell with plainer materials protects the book from dust and light. If you have rare books that you want to protect and preserve, consider having custom clamshell boxes made to house them. Decorative and plain styles are available in a variety of colours and materials, and presentation boxes make a great accent for gifts or special occasions. Get in touch with us today to discuss your needs, or view our rare books conservation gallery to learn more about book conservation projects by our studio. Family heirlooms can be works of art in their own right; this charming antique album is a perfect example of an item with great sentimental significance to a family, which also carries interesting artistic merit. The album recently came to Book and Paper Conservation Services for repair and preservation. The 19th century album has been personalized with the owner's initials in the bottom right corner. The album, c. 1905, had been created by an ancestor of the current owner, who was an art student in Edinburgh, Scotland at the time. An inscription on the first page dedicates the album to the girl's sister. Albums like this were popular in the late 19th and early 20th century, manufactured as blank books and intended to be filled with autographs, sketches or collages by the owner and their friends and acquaintances. A charming collaged page shows a tribute to Scottish bard Robbie Burns. Portrait of an artist, by a friend of the book's owner. The owner of this book had a wide circle of artistic friends, and many of the pages feature skilled drawings by known artists, as well as personal notes and images of Scottish landmarks. The entries range over a decade or so, and are executed in a variety of media, including pen and ink, watercolour, oil paint, and collage. Some pages have had tissue tipped in between to protect the drawings, but most of them are open and artworks alternate with blank pages interspersed. The binding of the album presents damage - the leather is cracked and the interior of the padded front cover is exposed. An old repair tape has yellowed and become brittle. The album was generally in good condition, but presented some damage to both the binding and text block. It is not uncommon for delicate materials used in the early 20th century to suffer wear and tear after over 100 years, even with gentle handling; however, if not addressed the damages will escalate the more the album is handled and viewed. Old repair tape being removed. Conservation treatment involved several steps. Damage to the front cover of the binding was repaired using Japanese tissue toned to match the original leather colour. An old strip of repair tape on a significant page in the album had become yellowed and brittle, and was removed so as not to cause further staining to the page. A new repair of Japanese tissue was applied in its place. A split in the text block was strengthened with a strip of Japanese paper as well. Repair to headcap of the album's leather binding. Interleaving the pages with acid-free tissue. Unstable media used in a number of the drawings, including both oil paint and iron-gall ink, had caused "burning" to the paper, some of which transferred to the verso and opposite pages in the book; some graphite drawings had also transferred loose media to the page opposite. The solution, in order to arrest further deterioration, was to interleave the pages with acid-free tissue and sheets of mylar, where necessary. The pages are interleaved with acid-free tissue and mylar where necessary. Conservation treatment at our studio has repaired the damages to the album, stabilizing it against future degradation and allowing it to be handled and viewed safely. The owners plan to digitize each page and make reproduction copies so that the original will not need to be viewed excessively, allowing all the family members to keep a copy of this wonderful heirloom. The album after conservation treatment. For more information on the work we do, and to see examples of other treatments, please browse our portfolio sections for rare books and archival materials! Get in touch today if you have a treasured object you are interested in having preserved. What was the first book that got you hooked on rare books and collecting? Preparing to reattach the covers of a half-leather book. Book and Paper Conservator Jennifer Robertson was recently featured on Jasper52's blog about rare book collecting. Read a short interview where she describes what got her interested in rare books and conservation. Jennifer Robertson, BFA, MAC, is accredited by the Canadian Association of Professional Conservators (CAPC). © 2018 Book and Paper Conservation Services. All images and content are the property of Book and Paper Conservation Services and its clients. No reproduction without written permission.